This is a simple turn-of-the-century English game. It is a simple folded carboard measuring 51 x 13 cms (when unfolded), with the rules printed on the back. 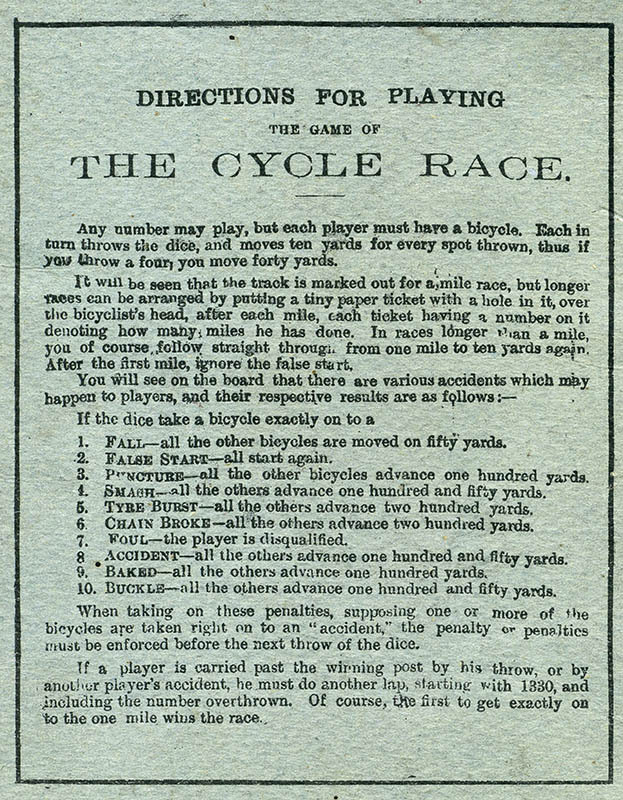 The rules state that "any number may play, but each player must have a bicycle". 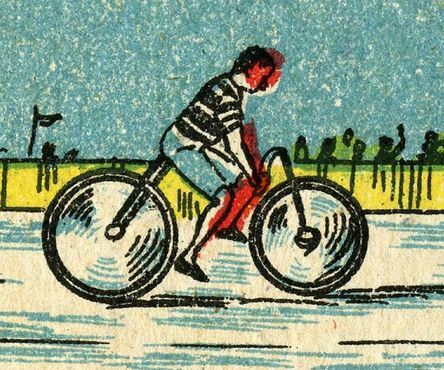 However, I have never seen bicycles -or dice, for that matter- included with this game, and of course they can be replaced by counters. The number of dice to be used is not specified. There is another presentation of the game, with a decorated back (scroll down for a picture). As far as I know the game is identical and of the same size. In the same series other games were made including a Motor Race and one called The Olympic Games. I have seen a picture of the Motor race game, and the cars depicted could perfectly be those of the 1894 Paris-Rouen race. In any case they have a distinctive XIXth century look. Of course, the Olympics' game cannot be earlier than 1896. 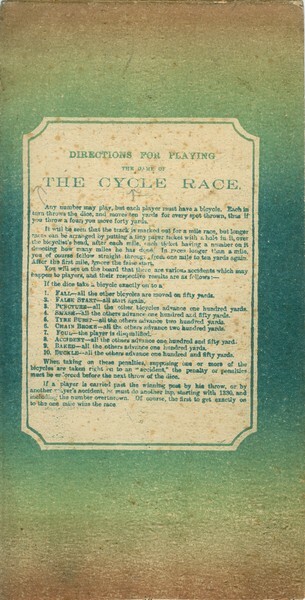 The game represents a one-mile race, though the rules also allow for longer races if the players feel like it. As every britton or american knows, there are 1760 yards in one mile. The rest of us use the metric system, of course. The instructions are printed on the back of the board. You will have to copy them in a separate sheet of paper before you play the game unless your memory is really good. What is unusual about this game is that the otherwise standard race incidents cause all the riders but one to move forward, instead of moving back just one rider. Of course, moving all the riders forward may cause new incidents, and these must be enforced before the next throw of the dice. With enough players in the game, this can probably cause a chain reaction which may even end the game after a few turns. However, to win a game a player must reach the one mile mark by an exact throw, or else he has to do another lap (of one quarter mile). I am not an expert (yet?) in the history of the bicycle but I think the rider on the left has lost the pedals and chain. No wonder he is the last in the race. 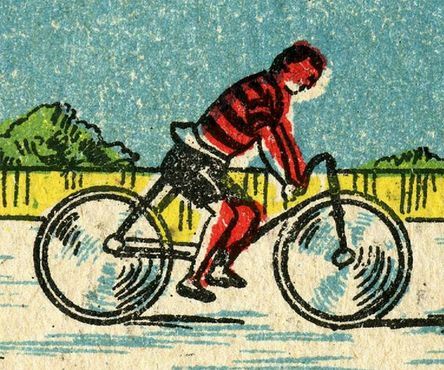 On the other hand, the cyclist on the right rides a safety bike typical from the 1890s. This 4-seat tandem might be an Orient Quad. 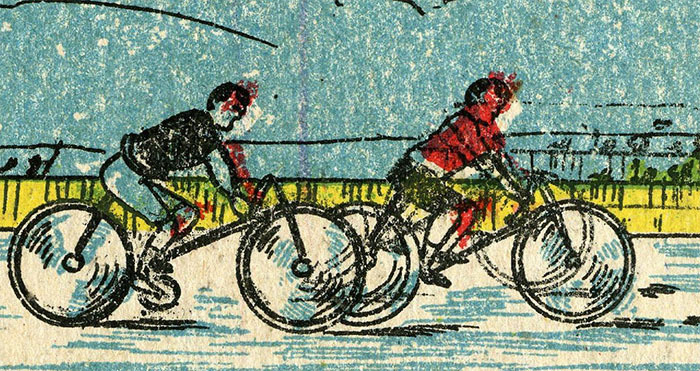 Is the rider on the front riding a tricycle, or is it just a misprint? This game can be found in different presentations. Besides the one with the (ugly) grey cardboard back shown above, there are at least two other versions.